I like traveling, but I also really like quiet weekends at home. So far, this one has been really good. 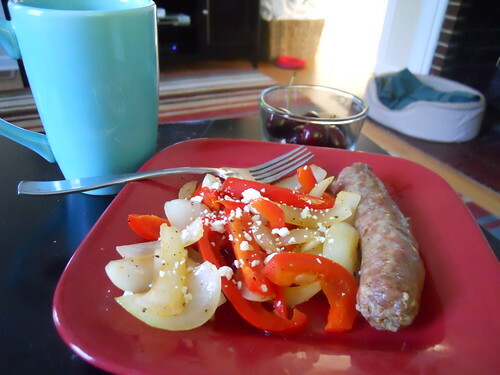 Jon made breakfast this morning – a cajun sausage of some sort + onions and peppers + a little feta, and cherries. And coffee, of course. We spent the morning finishing up the dreaded yard maintenance stuff. Not exactly my favorite thing in the world, but it could be worse – our yard was a total disaster when we moved in a few years ago. We’ve slowly tried to get it under control to the point that regular maintenance isn’t much trouble and I’m thinking it’s finally about as good as it’s going to get as long as I’m involved. 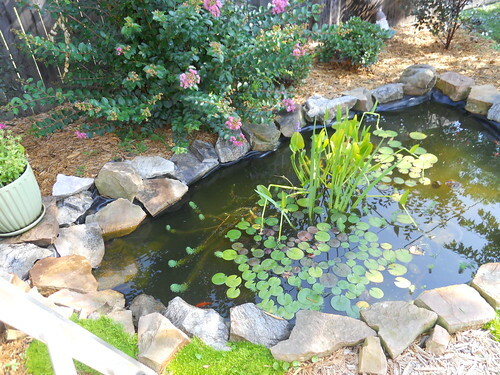 A previous owner dug a hole in the backyard and created a small pond that was so overgrown and disgusting when we bought the house that I thought it would probably be better to fill it in and be done with it – I even went so far as to try to find new homes for the fish that were miraculously living in the mess. Jon’s a little more adventurous and a little less lazy, so he talked me out of it and messes with it each year. It had a waterfall, but it kept falling apart, so we reformed the whole thing to make it less trouble. 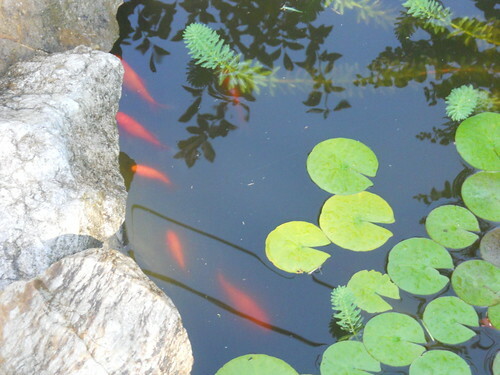 I gave most of the big fish to a guy in our neighborhood who has a much larger pond, but some goldfish stuck around and have been reproducing. Those suckers freeze every winter and pop right back out when it warms up. Apparently I didn’t learn a damn thing from any science class I ever took because not only do I know nothing about chicken reproduction, but I know nothing about how goldfish freeze and live to see another year, either. So weird. We had some shopping to do around lunchtime, so we ate lunch at a new (to us) place downtown – Latitude 35. I hadn’t heard of it prior to today – and Jon’s only caveat was that eat someplace we’d never been to before – so that’s where we ended up after weighing the options as we walked around. Their website says this: An urban outlook on comfort food, innovative sports viewing, and a premier nightclub – Latitude 35 is Knoxville’s haven for everything in an avant-garde venue. I’m not really/AT ALL a nightclub person … and just had to google “avant-garde” to make sure it means what I think it means … so I was a little surprised to find myself eating in the dark at 11:45am. 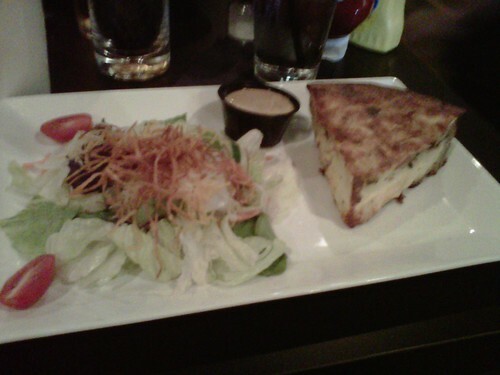 I ordered the quiche of the moment (3 cheese, I think) and a salad w/ginger chile vinaigrette. 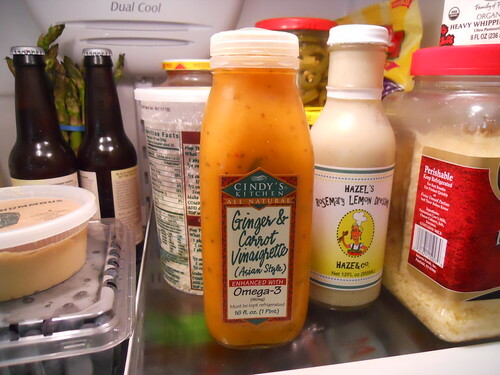 I loved the ginger chile vinaigrette so much that I tried to find something similar when we stopped at the grocery store a little later. LOVE ginger. Haven’t tasted this yet – hoping for the best. Jon’s daughter arrived home today from a vacation and told Jon that she was tired of eating in restaurants and wanted a home cooked meal – so he let her choose dinner. He roasted a whole chicken and shredded the meat. 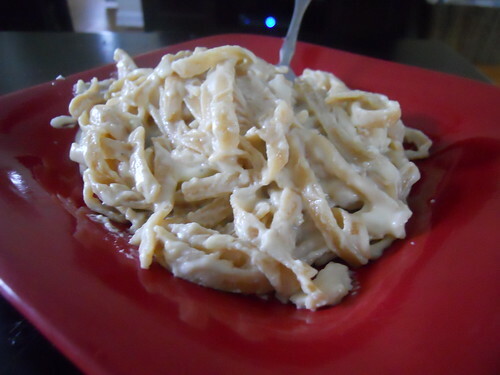 The sauce is milk + butter + heavy cream + flour + garlic + fresh basil + parmesan cheese. The noodles were basic whole wheat noodles. I know I say this all the time, but damn. He feeds us well. 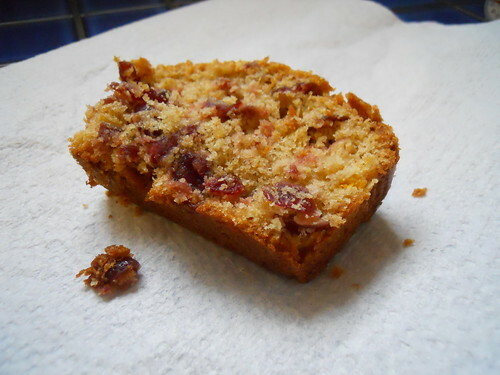 Dessert tonight was a piece of cranberry and orange pound cake that we picked up at Earth Fare. It was ok. I’m a big fan of the cranberry + orange combo, so I’m hoping I can convince Jon to make a better version of this for me sometime. I’ve had a couple of extremely (processed) carb heavy days. Time to switch gears. Do you mean to tell me that goldfish FREEZE and then REANIMATE? What the? That is straight-up PET CEMETARY! Well, the pond (mostly) freezes and supposedly they survive in the very bottom where the water ISN’T frozen. I have seen them frozen, though, near the top and didn’t find corpses later on … so … I don’t know. Weird either way.